Free Fall: It’s Time to Drop & Win! It’s time to Drop & Win! 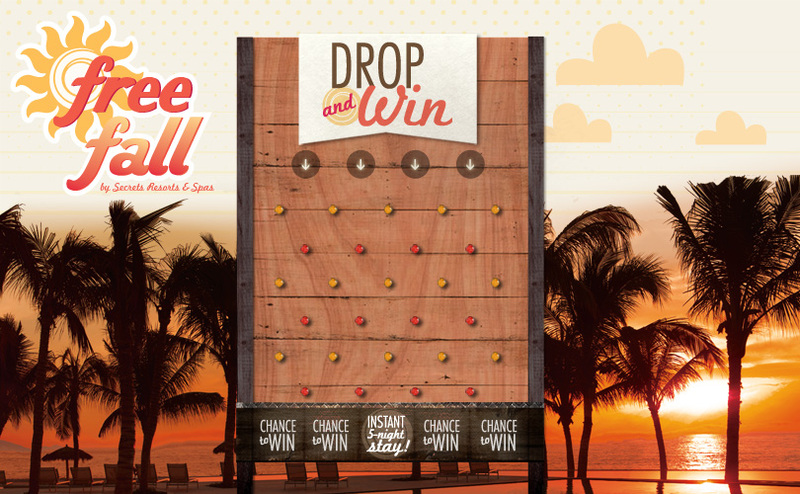 As part of our Free Fall Promotion, we’ve launched an interactive game that allows our fans to drop a coin on a plinko board for the chance to instantly win a 5-night Unlimited-Luxury® stay for two at Secrets Resorts & Spas! Plus, everyone who participates in the game is entered for a chance to win a 3-night Unlimited-Luxury® stay for two, which will be announced on our Facebook pages on October 1, 2012! So what are you waiting for? Visit our social media portal, “like” any one of the Secrets Resorts & Spas Facebook pages and then click the “Free Fall” icon at the top right corner of the page to play! Best of luck to everyone who enters! Don’t want to wait to win? Take advantage of free nights just for you this fall! For the first time ever, Secrets Resorts & Spas is offering the 3rd, 5th, 7th and 9th night of your reservation free! Plus enjoy $200 in resort coupons! Click here to learn more. This entry was posted in Secrets Resorts & Spas and tagged drop & win, facebook game, free fall promotion, plink game, win a free vacation. Bookmark the permalink.